While we weren’t in lectures which filled almost the whole day, we enjoyed some bird, whale, and iceberg spotting! The birds included fifty or more Cape Petrels that followed our boat all day, a Southern Giant Petrel, an Arctic Skua, and a Wandering Albatross. 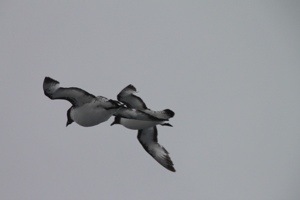 The Cape Petrels were pretty…black head and necks with upper wings speckled white and black. And of course, the Giant Petrel and Albatross were quite large. We saw the spray from three whales, but they were too far away to identify. Based on the shape of the blow and the depth of the waters, we suspect they were Fin whales. Our first iceberg spotting was just before 10 at night as we are finally getting close to land after two days of crossing the channel. Everyone that was in the bar ran to the port side of the boat to get a glimpse of the iceberg through the shroud of fog. We are traveling at about 10.2 knots, we’ve had a smooth crossing, and expect to be landing tomorrow! The lectures were quite fascinating. The first was the history of Shackleton and his expedition attempts to the South Pole. According to John, the historian on board, Shackleton and his crew were about 80 kilometers away from the South Pole before they had to turn around in the early 1900’s as they didn’t have enough provisions to survive. Since his attempt, two other expeditions made it to the pole, so on his next attempt he wanted to cross the whole continent. He and the crew took their boat to the south eastern part of the continent where the boat got trapped in the ice. They spent the entire winter on the boat frozen in the ice. They awaited for the ice to crack and hoped to be set free in the summer months; however, the shifting ice crushed the boat so they had to abandon ship. They drug some smaller row boats with them for bit, but they were too heavy. Five of the men made sails, covered the hull and set out across the open waters to South Georgia Island for help. There were closer landings, but South Georgia was downwind. It took them 16 days, and they only saw the sun three times which they needed in order to navigate. They traded turns at the helm and each time they essentially froze to the tiller. Miraculously, they landed in a calm cove, but needed to traverse across the island to the whaling ports. Three of them made this trek that had never before been done. They tobogganed across the ice in 36 hours, a remarkable feat given in current times it takes three days. The whalers helped them pick up the men on the other side of the island. They eventually made their way to Chile where they commissioned a boat to go south and save the rest of the crew who had been living off penguins while spending another winter in Antarctica during WWI. Amazingly no man was lost, and the expedition is well documented because Shackleton took a photographer with him! The glacier presentation was just as interesting. There are only three sheets of ice in the world. The Antarctic makes up two of them. The eastern sheet is the largest and the western sheet is the smallest. Greenland is the other ice sheet. The ice thickness in Antarctica is 4.8km, or 15,713 feet high. It is the highest average altitude in the world. 300 million years ago and currently the continent is 98% ice; however, 65 million years there was no ice in the Antarctic. Ice flows perpendicular to crevasses, so when we get on land we will be able to read the ice patterns…ready to get there…to see ice and penguins! Speaking of penguins, they seem to come in all shapes and sizes, but 60 million years ago they used to be able to fly. They actually evolved to not be able to fly…to make denser bones that will sink in the water and denser feathers to keep them warm. Because they need their feathers for warmth, they only molt once a year instead of constantly like most birds. They fill up on food to live off their blubber, stay on shore after breeding season, and molt for two weeks as they can’t go into the frigid water during this time period. They have a preening gland at their rear where they reach their beak for oil to use to water proof their feathers. Penguins generally spend 75% of their time at sea, can swim 12km per hour, may stand up to 1.6m high, and can weigh up to 80 kilos. In addition to the presentations, we had a cocktail hour where we met the captain. Oleg is a hearty fellow from Russia. We plan to go visit him on the bridge sooner or later.